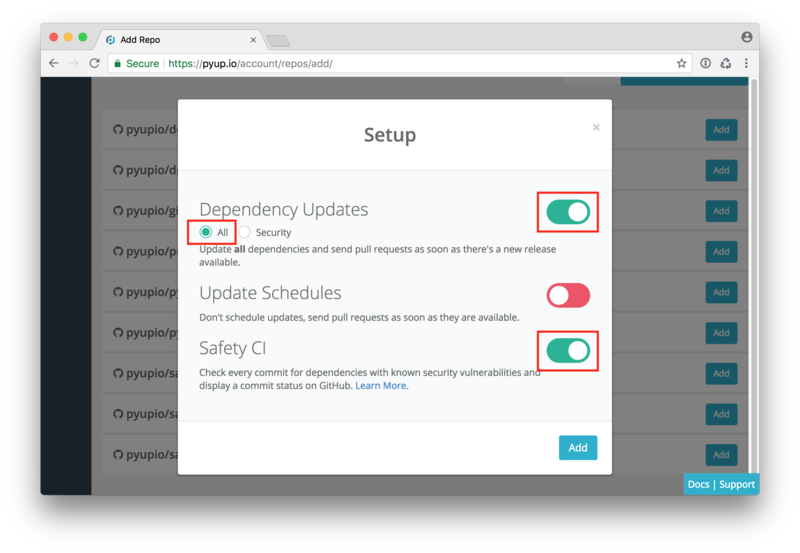 There are multiple ways to use the Open Source tools and services pyup.io is offering. This entirely depends on your project and if you want to use the open source tools or the online service. The online service is the easiest way to get started. Both Safety and the bot are open source. You can install and run them on your own if you want to. Let's first have a look on different use cases for the bot and Safety. This depends on what exactly you want. If you want your dependencies to be always up-to-date and you want to know which update is security related, take a look at the always up-to-date section. If you want to get security updates only and you don't care about regular dependency updates, check out the security updates only section. If all you want is security notifications and you don't care about updates at all, make sure to read the security notifications section. During repo setup, enable Dependency Updates, make sure all is selected and enable Safety CI. Install the bot locally and run it regularly via cron job. Install Safety locally or on your CI server (recommended). 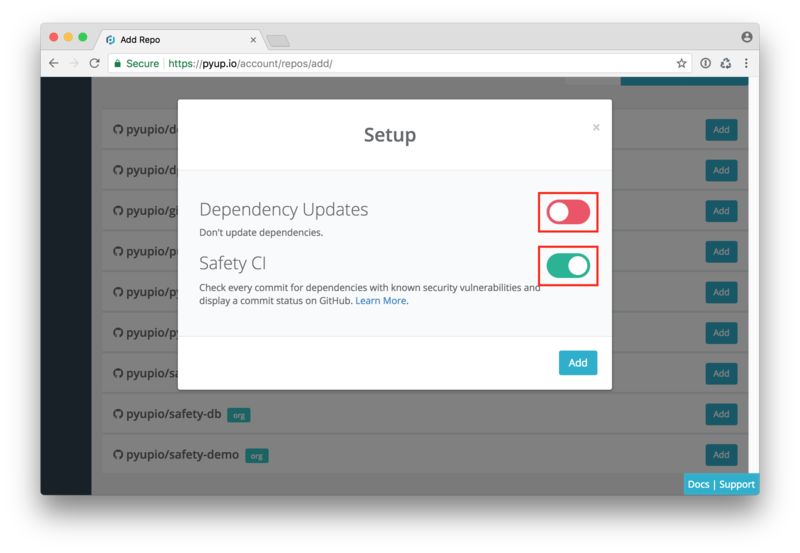 During repo setup, enable Dependency Updates, click on the security checkbox and enable Safety CI. Install the bot locally and run it regularly via cron job. Configure your repo by adding a .pyup.yml with update: insecure. Install Safety locally or on your CI server. Please Note: This setup requires an API key. During repo setup, disable Dependency Updates, and enable Safety CI. Install Safety locally or on your CI server (recommended).